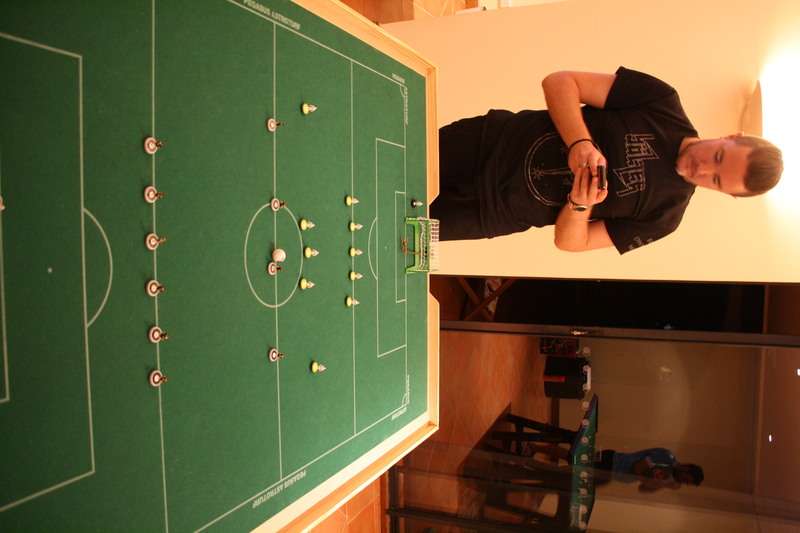 Following the great success of the second annual Subbuteo Parramatta Spring League, The celebratory Spring League Cup brought Subbuteo Parramatta’s official program for 2015 to a close. 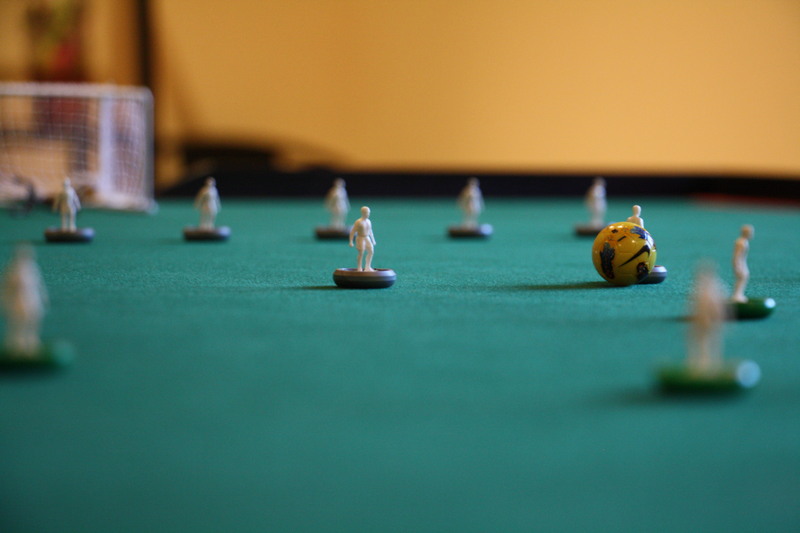 8 players descended on the New Trafford Subbuteo Complex in North Parramatta, 7 who had competed in the league plus one extra. A change of date meant that Spring League winner, Eliot Kennedy was out of the country, leaving the door open for someone else to take the consolation title. 2014 League Cup winner Steve Diasinos turned out to defend his crown, but knew he would be facing a battle. 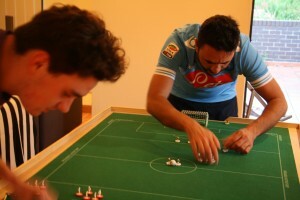 Fabrizio Coco started as tournament favourite, the event also marking the one year anniversary of his first competitive Subbuteo on Australian soil. Steve Dettre and the Lombardi brothers were also in with a shot. Mathew Barrie, Adrian Elmer and Louis Dettre, while knowing they probably didn’t have a realistic shot at the title, were keen put in good performances, however, and throw a few spanners in the works of the front-runners. Louis and Daniele prepare to go head to head. 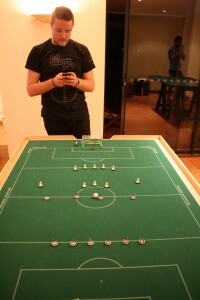 For the first time in the history of Subbuteo Parramatta, a true Swiss System was trialled, with 5 rounds programmed. The opening round was drawn randomly. Mat drew Adrian and immediately made full use of the home ground advantage, forcing Adrian to both play on an unfamiliar surface and with a borrowed team, due to a colour clash. Adrian took some time to find his feet, but settled in and eventually held on for a 0-0 draw. Fabrizio drew Steve Dettre and, in a tight tussle, took a 1-0 victory, though a desperate header from one of his defenders was needed to hold out Big Steve’s late onslaught. Daniele saw off Louis 4-0, while Raffaele had a much sterner test against Little Steve, earning a tight 1-0 victory. Round two pitted Daniele against Fabrizio and, in a forecast of the final standings, the two first round winners battled out a dogged 1-1 draw. Raffaele again won by the finest of margins, with Mat defending sternly and only allowing the solitary, unanswered goal to pass him. Big Steve had the run of the early play against Adrian and took a 1-0 lead to the break. Adrian, however, fought back in the second, taking a deserved equaliser, only to fall tantalisingly short as Big Steve picked up the winner with a sweeping counter-attack and the last flick of the match. Little Steve made hard work of his victory over Louis. In spite of peppering Louis’ goal, only one shot managed to break Louis’ stern goalkeeping performance. In round three, Fabrizio made extra certain that everyone knew exactly how he felt about Little Steve’s constant reminders that he had beaten Fabrizio exactly one year ago to take the last League Cup title. Fabrizio pumped 5 past Little Steve’s hapless defences, well and truly consigning memories of that first showdown (where Fabrizio had to use a borrowed team in his first games in a couple of years) to the dustbin. Mathew repeated a common theme for his performance for the evening, a tight draw, this time against Big Steve, each player slotting one past the other. Adrian scored rapid goals at the beginning of each half as well as a third in an, otherwise, well contested match against Louis. However, all the action took place on pitch number 1. Raffaele had jokingly begged for a referee before the showdown against his flesh and blood but, of course, with all participants playing, they were left to their own devices. Midway through the second half all hell broke loose, and the familiar Italian curses that regulars at Subbuteo Parramatta events are beginning to now understand were flying. A contentious decision in the middle of the field led to a goal, lots of yelling and an eventual forfeit. With 10 minutes to settle, Raffaele and Daniele were coaxed back onto the pitch by their next opponents. While Daniele was not his usual fluent self, he managed to slip 3 past Adrian. Meanwhile, Raffaele struggled against Fabrizio, a 3-0 victory to the latter realistically sealing the title for him. In the ongoing battle of the Steves, the Little version took the honours with an, as ever, tightly contested 1-0 victory. Louis scored his first goal of the evening in his draw with, you guessed it, Mathew, who was making a habit of picking up solitary points from his close games. Little Steve checking out the odds before his final match. The final round saw Fabrizio do his lap of honour around the unfortunate Louis, who was only drawn against the winner in the swiss system due to clashes in the draw amongst other players. Raffaele and Big Steve fought out yet another close tie and Mathew proved he possesses one of the stingiest defences, in spite of going down 1-0 to Daniele, the win slipping him into second place on the table. Adrian and Little Steve fought out one of their regular close encounters, this time both having to settle for a 0-0 draw, in spite of both creating a couple of good chances each. Many thanks to Mat for hosting us, the first ever WASPA tournament to be held at New Trafford, and thanks to the neighbouring flats for the great smells of cooking that came wafting through the windows throughout the evening! For full results and final table, click here. This entry was posted in News on 20/11/2015 by ajebec.